Kyle Morgan led an active lifestyle — he pushed a skateboard, kayaked and rode motorcycles competitively. There was no action sport he wouldn’t try. But a bad decision in 2010 left him with a spinal cord injury, paralyzed from the shoulders down, with some movement in his arms but no fine motor control of his hands. Now considered a quadriplegic, his life was altered forever. He spent three years in a power chair, assessing and reassessing his life. One day, the chair broke down, stranding him in one place, helpless. For Kyle, that was rock bottom. He decided then that even if he was a challenged athlete, he was still an athlete. Despite the success, he still missed the excitement of kayaking. As he tells it, “I thought my days of being on the river were over. 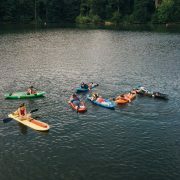 I had a kayak, but couldn’t use it because… I couldn’t keep my balance or even grip the paddle.” He’d never heard of adaptive kayaking, and frankly, adaptive sports — active activities for challenged athletes — didn’t get much press coverage.A friend helped connect Kyle to Bellyak. Kyle remembers, “A kayaking buddy of mine found Bellyak’s Facebook page and shared it with me. From the moment I saw it, I knew I could use it.” Kyle reached out to Bellyak and built a friendship with owner Adam Masters. Adam was so intrigued by Kyle’s attitude that he lent him a Bellyak to try out. And just like that, adaptive kayaking in a Bellyak became a reality. 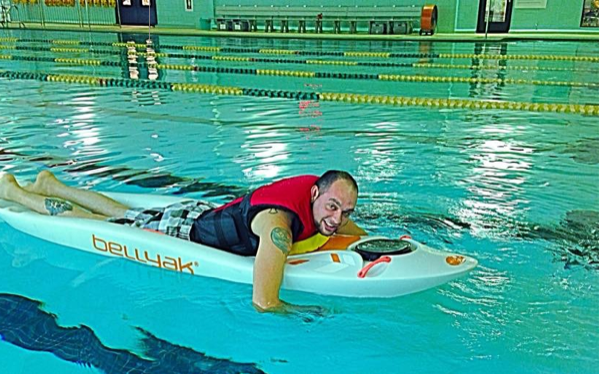 Adaptive sports, including adaptive kayaking, has helped revitalize Kyle’s attitude on life. It’s something he brings to his everyday life as well. “Just because I’m paralyzed doesn’t mean I’m going to live life differently,” he says. He’s learned to embrace his new life, appreciating each day and trying get as much as he can out of each moment. See Kyle’s story on video here.